Joni's entire performance from "A Day in the Garden"
I absolutely love this video, it's a magical performance. It's a shame there's not a better quality transfer of this; it deserves the best audio and video quality. I only got to see a single live show but it was a great one at Barton Hall, Cornell University, Ithaca, NY. The memory has been indelible. Thank you so much for your beautiful artistry! Spectacular. No wonder it got rave reviews from NYTimes and other journalists at that time. JM manages to keep the spirit of the message of live a good life and do what you can for the world. She does this at the expense of not making concerts hit parades...which is risky/hard call because it large settings people do need to have 'short attention spans' and need to have fun. No wonder there were four generations of chins quivering in the audience, as she recalled in a later interview. Delighted to see she and her fellow musicians got the love and appreciation even in a large venue that has been missing through most of Joni's career. Sure, tons of 'accolades and honors' but how bout some plain old joy in me and my music for you. She got it in spades this day as did the audience, much to their credit as she does (she is not 'easy' in large venues, its more personal.) She has always wanted to lead, inspire us and here is that evidence 30 years into her public life--a message to keep going and giving in some way every minute on earth. 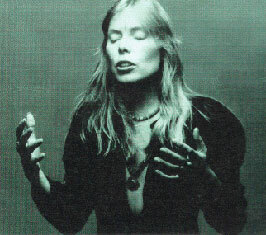 Thank you Joni just as people as diverse as Hillary Clinton and Ahley Judd and Shawn Colvin said in their tributes to you --simply THANK YOU for what you have done for the world. I agree you can say anything you need to at this point, you have worked like a dog. Love...funny you even wrote a song by that title-figures.